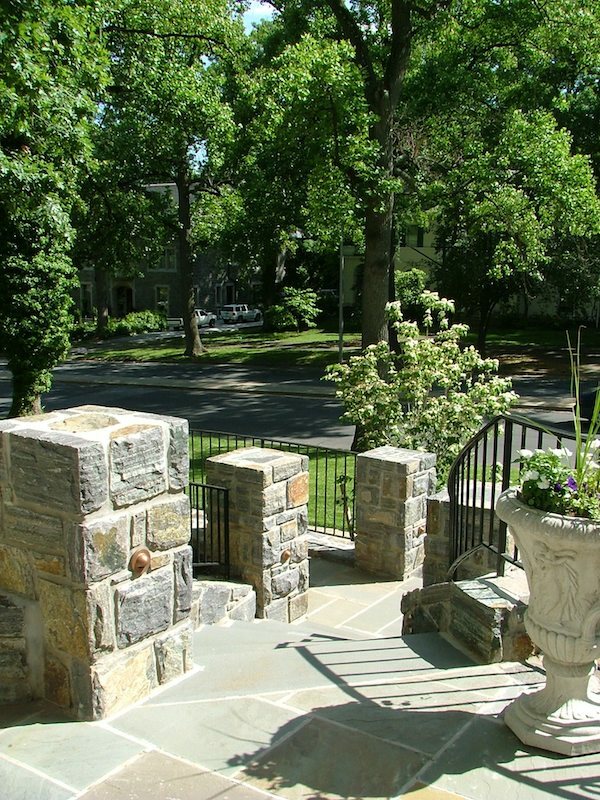 The experience of ascending up from the public realm of the busy street to the overlook and serenity the entry courtyard and gardens seems to say, "Welcome friend, you are important." Prominent entry and courtyards invite guests into the home and provide classic spaces for all facets of life. 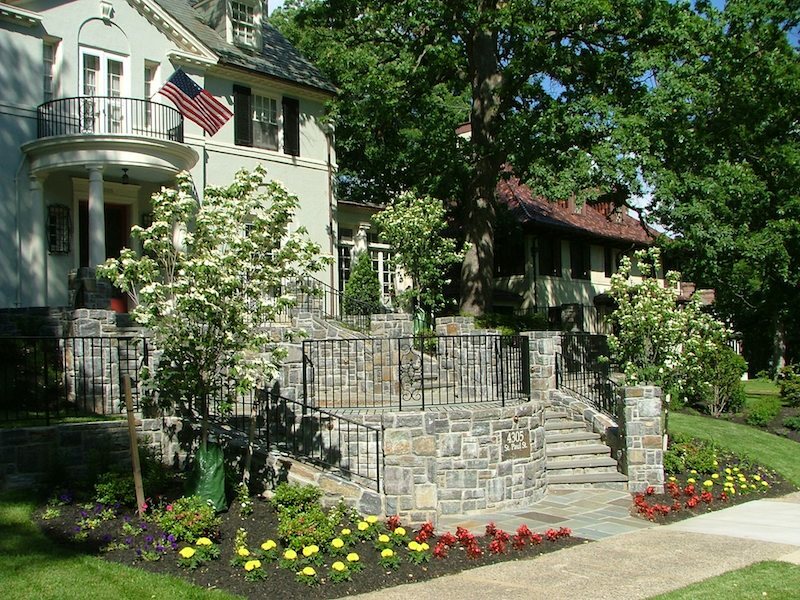 Located in a classic and historic community in Baltimore, Maryland. 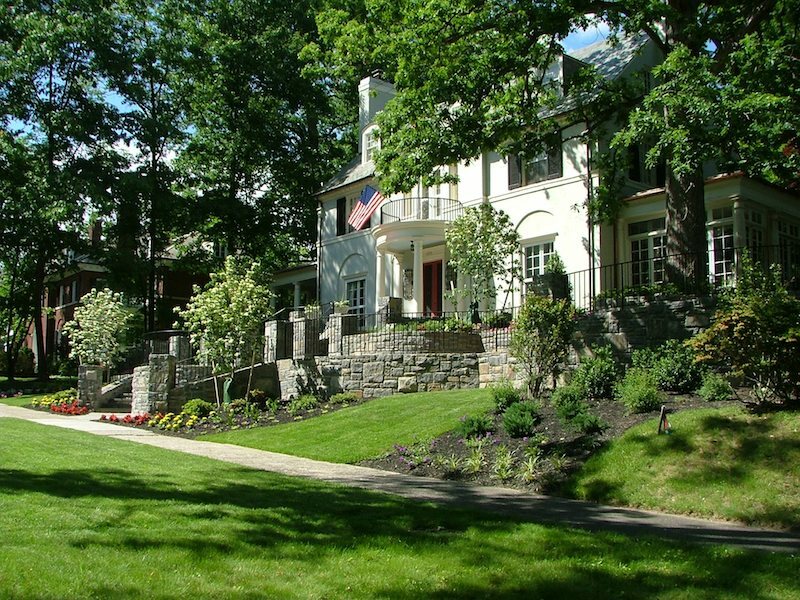 Prominent home and property on a primary thoroughfare. 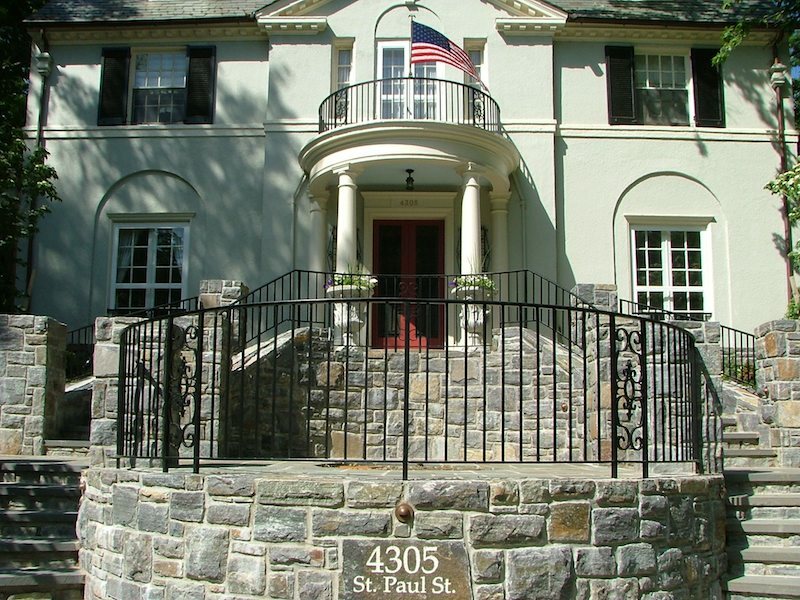 House setting on a hill above the street with a steep concrete stairway to the entry. View of house obscured by overgrown and outdated plant material. Limited access from front to patio and gardens in the back. No sense of entry from the street. 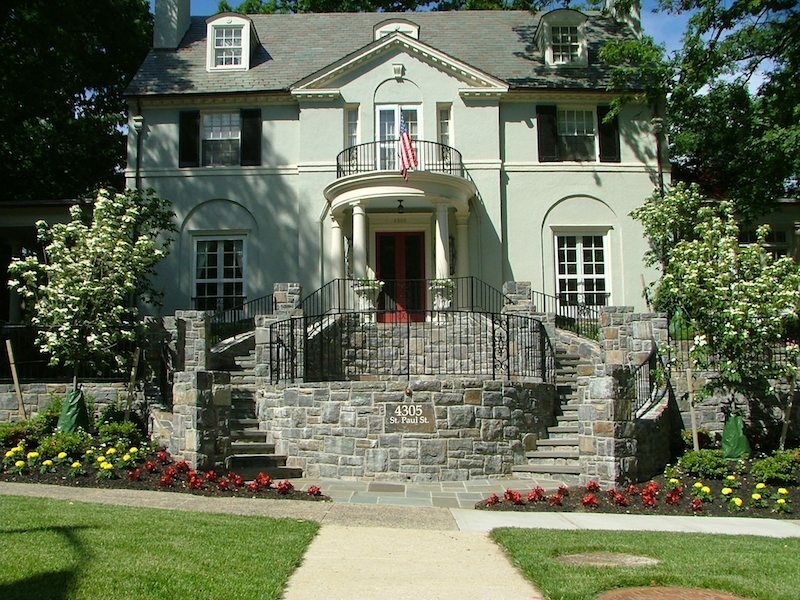 Create a prominent entry which is inviting to guests and creates a strong sense of presence from the street. Design must consider issues of safety and privacy. 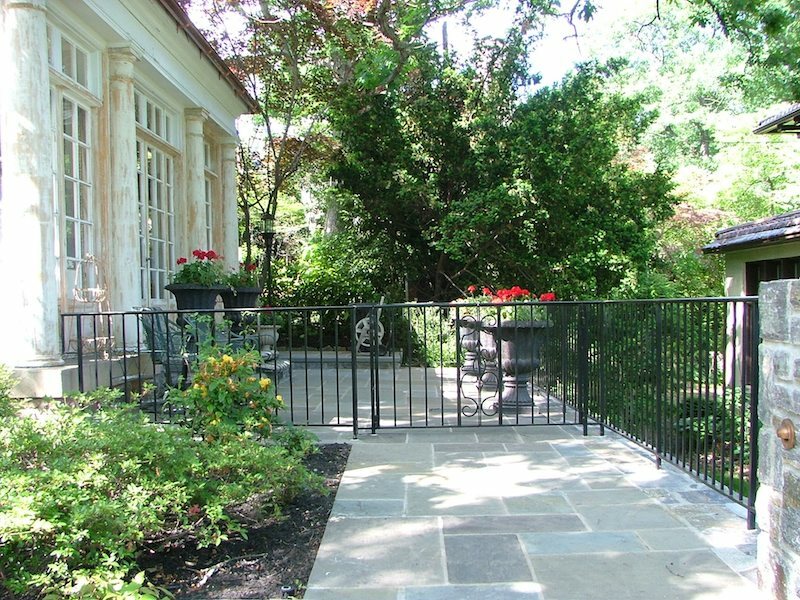 Create a flow from the street to the front entry to the side porches, back yard and driveway/parking. Develop an outdoor space connected to a sunroom/office. 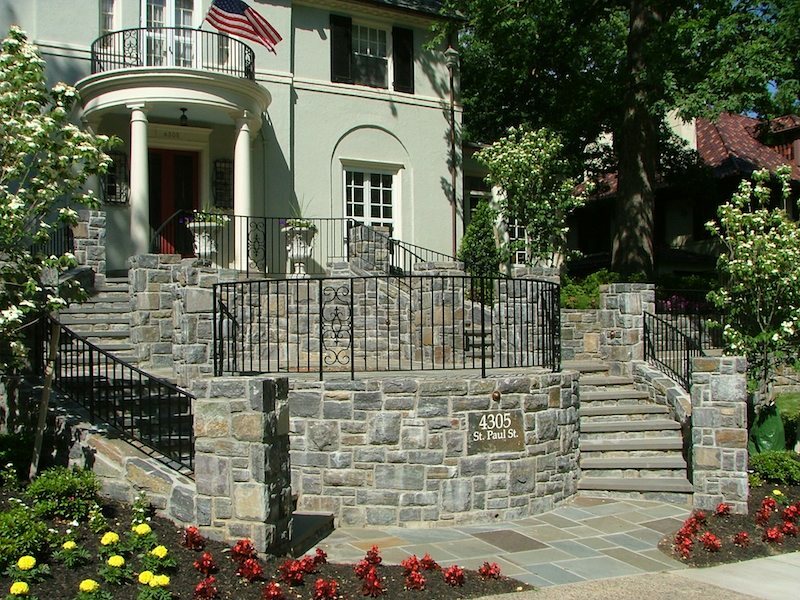 Design and materials consistent with the architecture and historic community requirements. Provide gardens, features and structures to enhance the visual appeal and experience of the home. 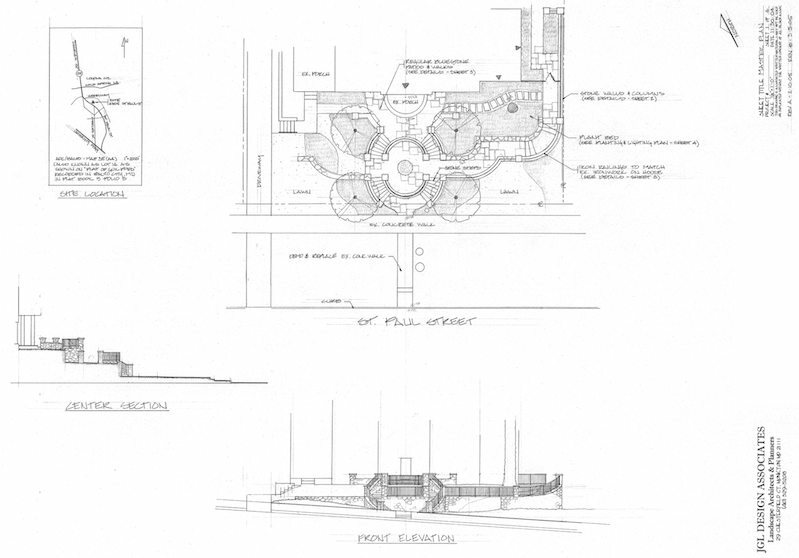 Address the steep front slope and drainage issues in the design. Protect and integrate the large existing white oak. 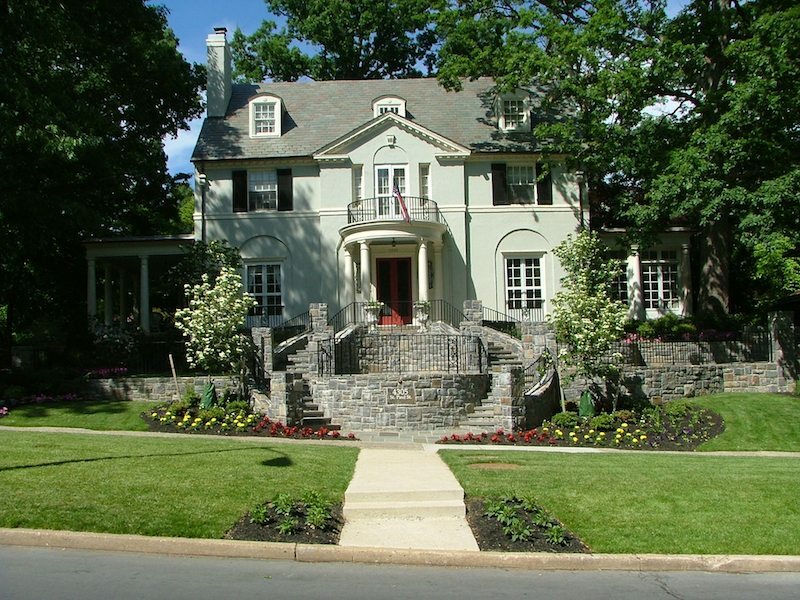 The house has a significant presence and prominence from the street. 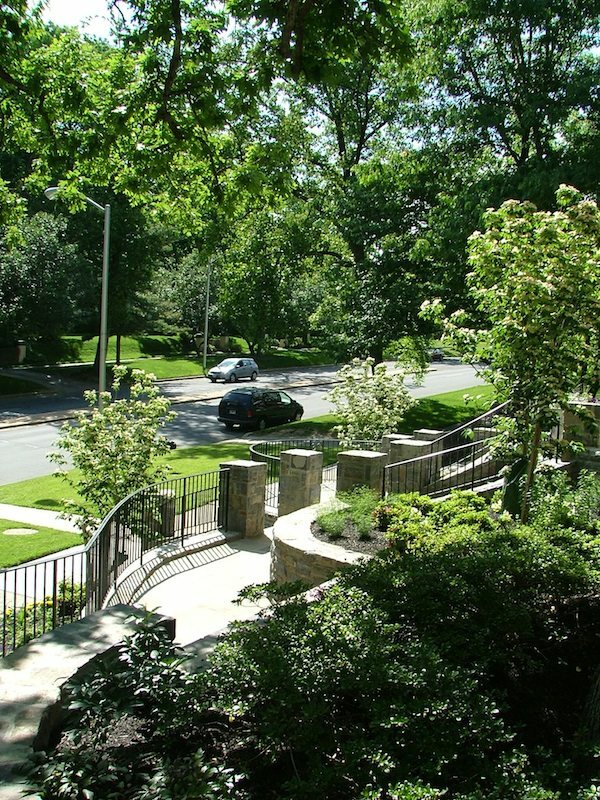 Many opportunities exist to engage the energy of urban life, meet and greet neighbors and friends, or immerse yourself in the sunny or shady gardens. Guests arrive at the grand and inviting entry from the street. They can choose to take the left or right circular stone stair. 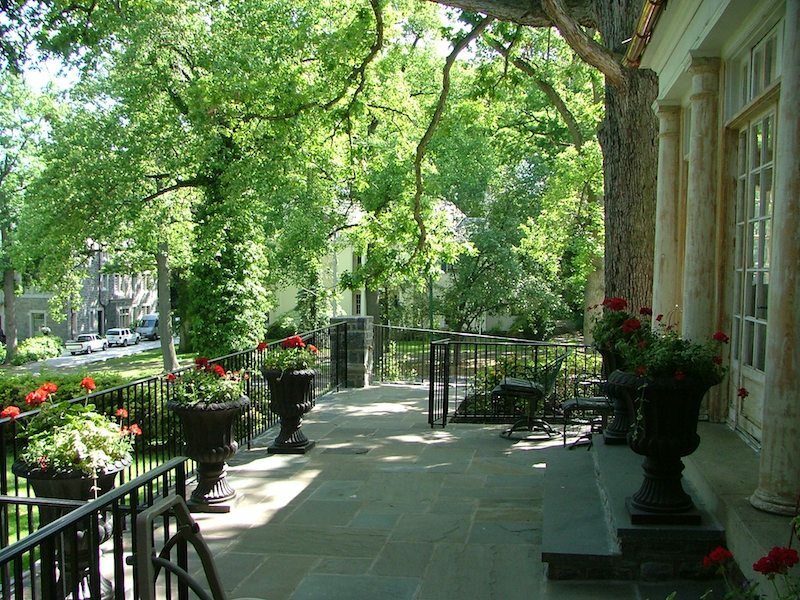 At the first landing they can decide to continue to the overlook reception area to the porch; take the stone walkway to the left up the stair around the old oak tree to the elevated patio that transitions to the back gardens; take the left lawn path through the garden which leads to the side porch and entry; stay and engage the city on the central circular terrace; or sit for a time on the garden wall before entering the house. 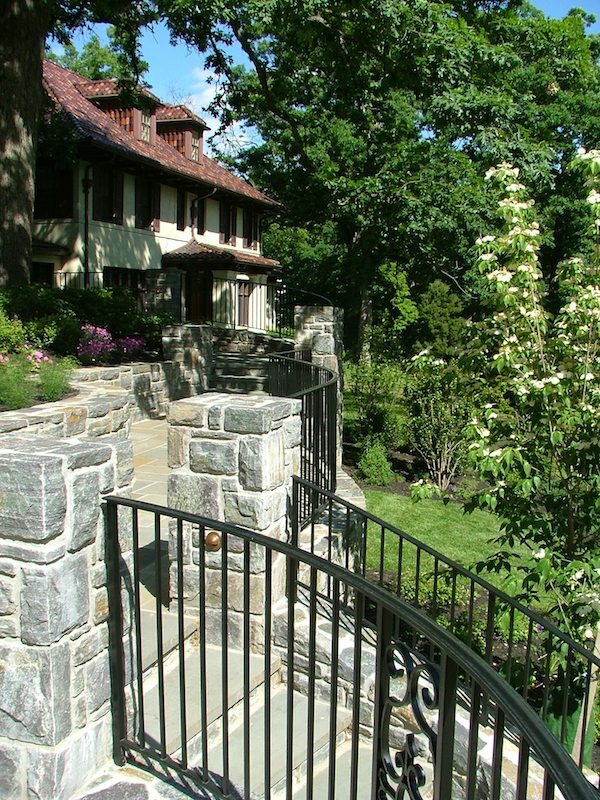 The elegant iron railings and gates match the existing ironwork of the house and provide an edge to the garden spaces defined by the granite retaining walls. The gardens enhance the entry experience, provide an engaging view from the street, and soften the transition from the activity of the street. The stresses of the working day are eased by sitting for a spell on the veranda off of the office. The space rises above the street and engages the energy of the city while providing private and relaxing outdoor environment. 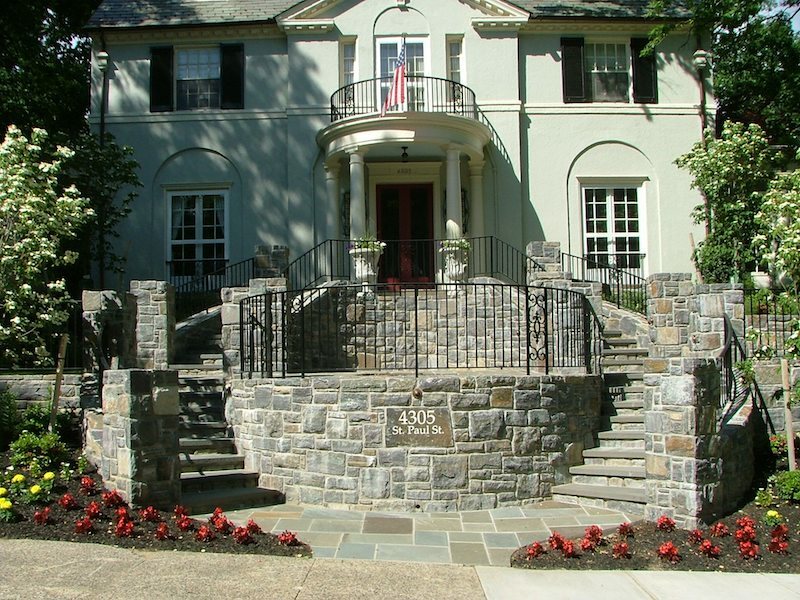 The granite walls appear as an original aspect of the house and address the significant elevation change from the street to the front entrance. 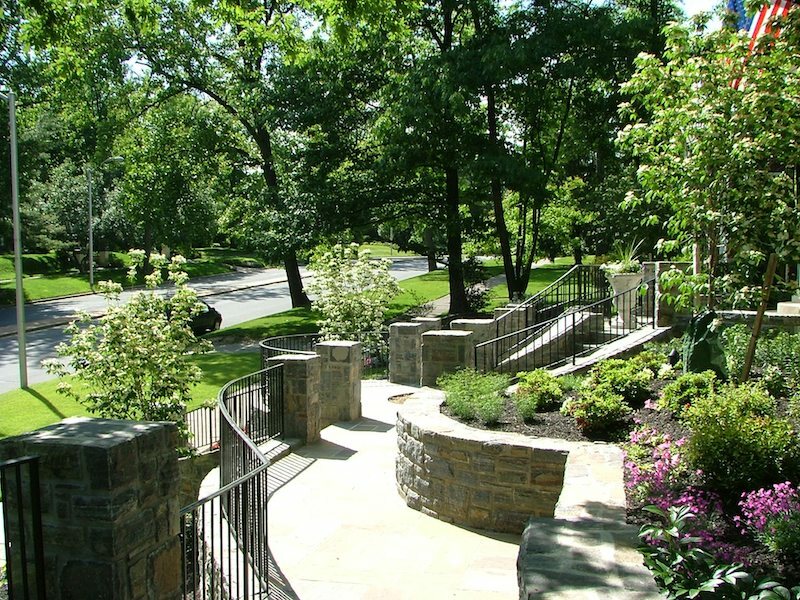 Northbrook Landscape—Walls, stairs, walkways, patio, grading & drainage. 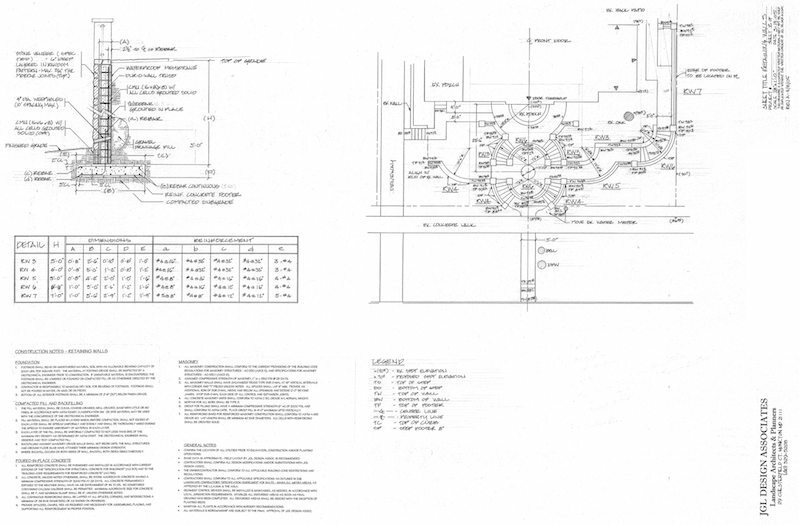 Chesapeake Irrigation Systems, Inc.—Landscape Lighting & Irrigation. Shire Valley Design—Ironwork Railings & Gates.